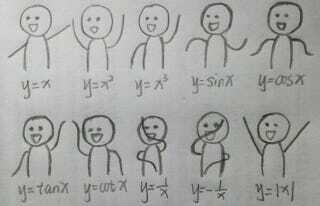 If you have trouble remembering how to graph different mathematical functions, these simple figures with their dancing arms can help. At the very least, they'll make you think of math every time you dance to YMCA. Philips Shiu posted this handy and adorable guide to graphing functions. Perhaps people who engage with kinesthetic learning styles would find these dances a helpful way to burn those functions into their brains.